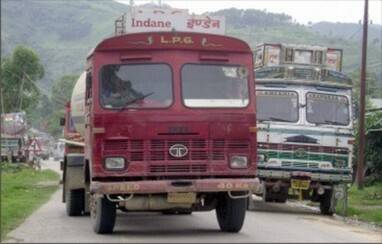 Imphal, Apr 23 : Oil tanker drivers in the state stopped services from Monday to denounce the abduction of their colleague in Nagaland by unknown gunmen, triggering panic buying by Imphal residents at fuel outlets. This came amid a growing people's protest against the gunning down of another driver, S Babu, and torching of two loaded trucks at Charoi Pandong area along the Imphal-Jiribam highway by suspected rebels on last Wednesday night. A motorcade of over 100 loaded fuel tankers escorted by CRPF men was going from Khatkhati in Assam to Manipur on Sunday morning, sources said, adding that when they stopped for a while at Khuzuma area in Nagaland, driver S Surjit was whisked away by unknown armed men. Condemning the incident, the All Manipur Petroleum Tanker Drivers' Union on Monday afternoon announced they would stop plying fuel tankers till Surjit is freed by his captors. There have been numerous cases of killing, abduction and harassment of drivers in addition to torching of their vehicles by miscreants along the highways leading to Manipur, lamented Y Bhupenchadra Ghosh, the union's president. Urging the authorities concerned to secure safe release of the driver, Ghosh also appealed to the people, particularly civil bodies, to extend support to the union's 'democratic' stir. Owing to a series of bandhs called on the Imphal-Dimapur and Imphal-Jiribam highways by different bodies on and off for the last few days, the stocks of many fuel outlets in the state have dwindled and many of them remained closed. The Union's sudden announcement triggered panic buying of fuel at some outlets in Imphal even as stocks ran dry. In the meantime, the Transporters' and Drivers' Council ( TDC) donated Rs 50,000 to the bereaved family members of Babu. The council's president, H Ranjit, handed over the amount to the late Babu's mother at their Samurou Awang Leikai residence in Imphal West on Sunday. The joint action committee set up against Babu's killing has not taken his body from the mortuary of RIMS here as a token of protest even as deputy chief minister Gaikhangam assured to take stringent action against the culprits.